The goal was five more of the Catskills’ high peaks on one of the last weekends before winter, part of a quixotic mission to summit all 35 hiking barefoot. Odie and I piled into the car right after breakfast, and the drive to Windham went smoothly — except for route 23, where we had to stop at three traffic lights in a row, which sorely tested my patience, and then navigate a construction zone with a needlessly restrictive speed limit. Yet once out of the car and on the trail, these frustrations vanished quickly. The path to Windham High Peak was a delight: smooth dirt at a moderate grade — a rarity in the rocky rugged Catskills — and I moved almost as quickly barefoot as I would have in shoes. From the summit, we looked south at the distinctive silhouette of the Blackhead range, which Odie and I had climbed just a few weeks earlier. Back then, we had marveled in the details: traversing three peaks and three notches, experiencing scrambles, slabs, and sometimes smooth trail, and discovering different plants and trees with each step along the way. Now for the first time, we got the big picture. On the way down, there was a completely random surprise: hiking up the trail was Mike Kudish, preeminent expert on the Catskill forests, with whom Odie and I had gone on a hike just the week before. We were all three of us surprised by the encounter, as well as pleased. Mike’s knowledge of the forests is encyclopedic, and picking up on a few data points from him helps me better understand the stories of the land. Windham done, we decided to skip Big Indian and Fir and opted for an early dinner instead, arriving afterwards at the trailhead for High Kaaterksill Peak just after dark. 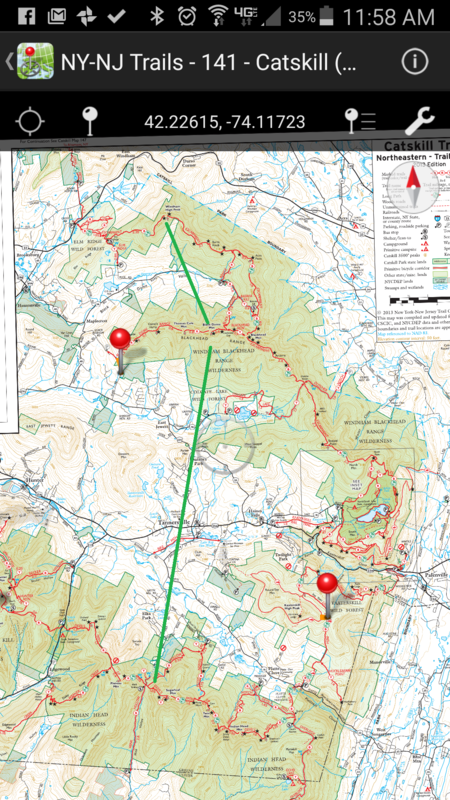 Odie and I had been here in the early spring, and we knew a rough trail was waiting for us, but now, at night and barefoot, Kaaterskill was going to truly test my patience. The trail initially followed a steep and heavily eroded logging road covered in loose rock, which was in turn buried in dense leaf litter, making every step a surprise; it was impossible to develop any pace or rhythm. After a mile or so, the trail leveled off, and suddenly there were long flat rocks covered in thick moss — and this was more luxurious than walking on shag carpet — but this lasted for only 50 yards, before the path deteriorated into a tangle of roots and puddles and stream crossings. Each step required concentration, the pace was abysmally slow, and I began to feel deeply weary. In the distance, lights from towns along the Hudson River winked through the trees, and above us a few stars peeked through. Then I stepped from a wet rock and plunged into ankle-deep mud, and the trek began to seem nightmarish. At an intersection we turned left onto an unmarked, unmaintained trail which clambered up over steep rock slabs. It was dripping wet in many places and hard to follow at night. I dialed up my headlamp to a higher power. We made it to the top, caught our breath, and turned back. The descent was slightly faster — until we got caught in a shower of freezing rain. And then it was back into the mud, and even with sandals on for the descent, stumbling down the logging road was almost as bad as going up. I was feeling pretty beat-up at this point, and while the plan had been to shelter over night in the Mink Hollow Lean-to and then get an early start on Sugarloaf Mountain, I made a judgment call that the lean-to was likely occupied. Without a tent or tarp, I decided to call it a night. When we finally reached home, Odie made a beeline for the couch, while I stumbled into bed. The sun rose the next morning, presaging another beautiful day in the mountains, and after breakfast we were back on the road, and soon enough pulling into the parking area below Mink Hollow. 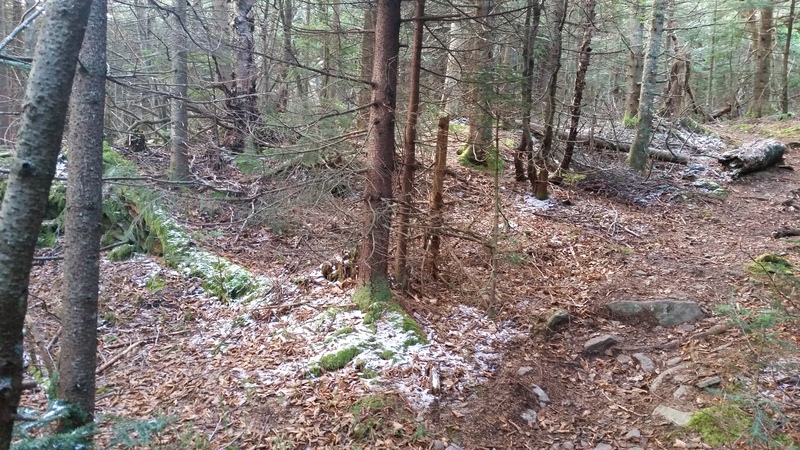 The trail to Sugarloaf started up a former logging road that was in even worse shape than Kaaterskill, and I stumbled forward one step at a time, feeling frustrated and surly. Plus my feet were sore from yesterday, and each mistep on the tumbled rocks brought a wince and a groan. But once past the lean-to, the scramble to the summit was great fun: 1200 feet up in a single mile, for an average grade of 23%, it was like climbing on a jungle gym, and plenty of large rock slabs with convenient places to step. Now I felt better, although it was chilly, with occasional snowflakes tossing about in the air, and patches of snow had accumulated on the ground, and small icicles were forming where water dripped off the rocks. We passed a group of backpackers, and sure enough — they had spent the night in Mink Hollow lean-to. Last night’s judgment was correct (there wouldn’t have been room for me and Odie), validated by another seemingly random connection. From the summit, we made sure to locate the Shawangunks lying far in the distance, just as we had on a previous hike from the summit of Twin Mountain, the next peak over to the east. On the way down, as we passed a vantage point on the shoulder of the mountain, I happened to glance north, and in the distance stood three peaks silhouetted against the sky that seemed strangely familiar. Indeed, it was clear from the map that this was the Blackhead Range once again, only this time from the south. Another chance connection: seeing this range from both directions on the same weekend, and connecting the sight with the mountains’ names and locations, and with the memory of being there. 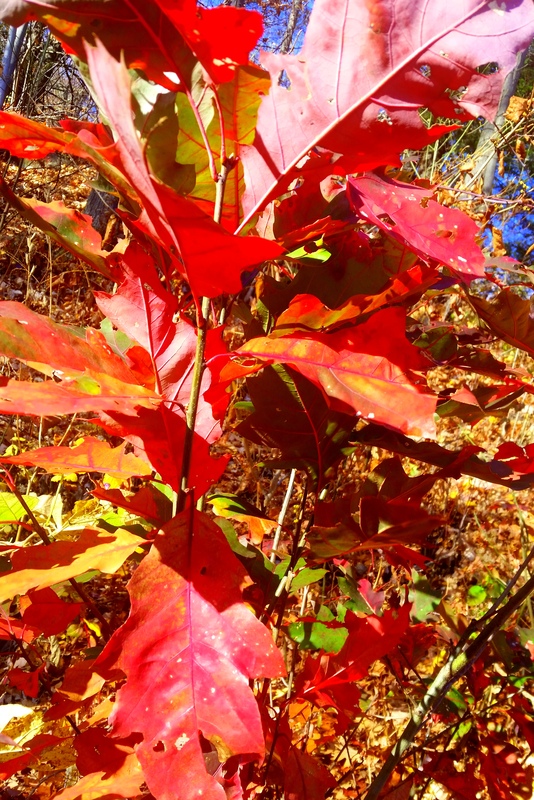 On the drive back, we admired the last of the northern red oak glowing in the late afternoon sun, likely the last of the fall foliage for this year. As we neared the George Washington Bridge, to my annoyance the traffic began to back up, and I struggled to maintain my composure, feeling suddenly as weary and dispirited as I had when laboring up Kaaterskill in the dark. And then I made one last connection for the weekend, as it dawned on me that part of the allure of barefoot hiking — besides the benefits of form, balance, and strength and the fun of going natural — is that it teaches patience. Which may be one of life’s most important virtues and a quality that I need more of. Windham, Kaaterskill, and Sugarloaf bring me to 18 of the 35 done.